A few shots of the next Windows 10 Technical Preview build have begun to appear online showing various cosmetic improvements to the OS. Screenshots carried by WinSuperSite seem to confirm that build 10056 will include the ability to completely resize the start menu in future versions and this comes in alongside a new 3D recycle bin icon. Two of the shots include the new start menu with one illustrating its usual position in the bottom left corner before the next picture shows a full screen representation of the same start menu. It's also interesting to note that in both images the power button has moved to the bottom left corner of the menu. Elsewhere Microsoft has ditched its grey 2D Recycle Bin for a similarly grey but now 3D icon for all the trash generated by your PC. Lastly, there is a new style overlay dialog in the advanced settings page that suggests a new style is being adopted across all dialog confirmation boxes. Update: According to The Verge, the leaked build shows off Microsoft's focus on the touch experience with Windows 10. "When you enable tablet mode any apps on the taskbar are removed, and you're thrown into a UI that only has access to the Start Screen, virtual desktops, and the Cortana digital assistant," the publication reported. 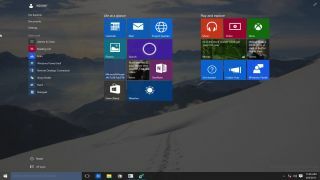 Microsoft last released a Windows 10 Technical Preview build to Windows Insiders a little under a month ago when Build 10041 brought a variety of improvements to the virtual desktop and start menu, more language options inside Cortana, and a lot more. Windows 10 will get its commercial release this summer and owners of Windows 7, 8 and 8.1 PCs will be able to upgrade for free within the first year and Microsoft has yet to reveal the pricing strategy from there forwards.